Brunswick-owned Harris FloteBote and Cypress Cay Pontoons are spending $1.2 million to move manufacturing operations to a facility in Fort Wayne, Ind., that is nearly triple the size of its old one, which also was in Fort Wayne. The new 360,000-square-foot facility used to be occupied by a division of Lincoln Foodservice Products LLC, whose parent company is Manitowoc, almost tripling the size of the current 120,000-square-foot factory, Harris FloteBote and Cypress Cay marketing manager Jane Schlegel told Trade Only Today. The new facility is being retrofitted and remodeled with plans to begin production at the Hadley Road location in August. Brad Anderson, vice president of marketing and planning for the Bayliner, Meridian and Sea Ray brands that make up Brunswick recreational fiberglass boats, headed up the operations prior to taking on his new role. Anderson told Trade Only in early June that Harris FloteBote had nearly tripled its business between 2009 and 2012, adding that Brunswick would “continue to invest” in the brands. Brunswick officials, joined by Gov. 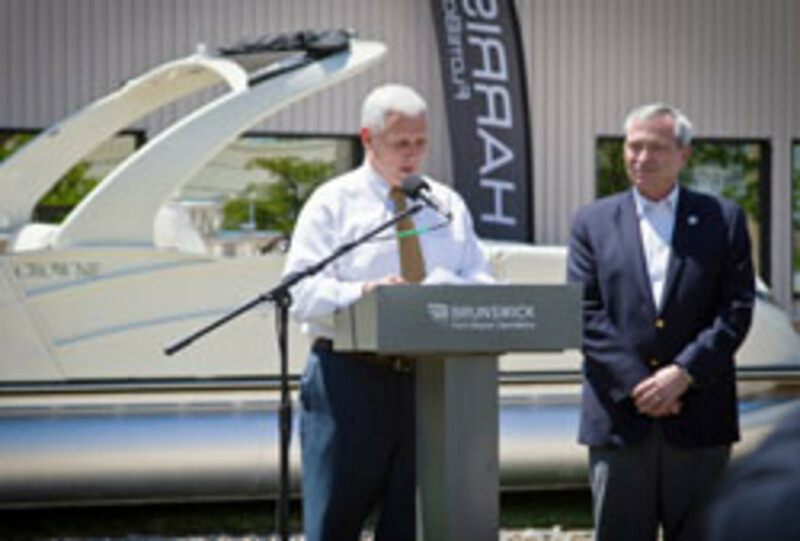 Mike Pence, R-Ind., and Fort Wayne Mayor Tom Henry, made the announcement Thursday afternoon. Brunswick Fort Wayne Operations had considered other locations, but the decision to stay in northern Indiana and invest $1.2 million to expand its operations was attributable, in part, to the support the company received from Allen County, Fort Wayne and the state of Indiana. The Fort Wayne Operations, which currently employs 261 full-time workers, anticipates hiring an additional 200 employees by 2016, which will include positions ranging from salaried to part-time. This year will mark the 50th year that Harris FloteBote has been manufactured in the region.